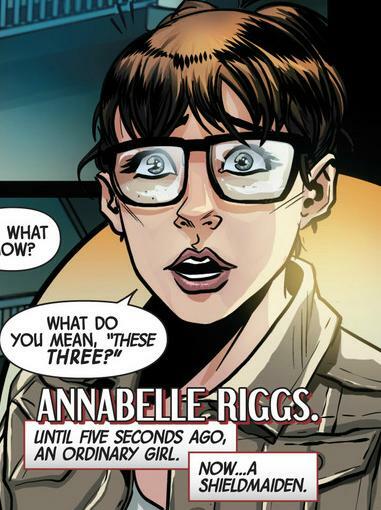 I've been reading Sam Humphries "Uncanny X-Force" and Cullen Bunn's "Fearless Defenders". I started out unimpressed by "X-Force", and somewhat enjoyed "Defenders" as I will call them for short. It got to a point I was seriously considering dropping "X-Force" but then something weird started to happen with the series. With issue #7 "X-Force" suddenly improved in quality exponentially and "Defenders" seemed to be less and less enjoyable with issue. In other words, one series is getting better at a startling speed and the other is decreasing in quality at a noticeable rate. The Rise of Enjoyment in "X-Force"
Sam Humphries took over the re-launch of "Uncanny X-Force" and had some big shoes to fill considering how amazing Rick Remender's run was. While there were two comics that sort of spun out of that original series ("Cable and X-Force" is the other) this one actually picked up plot points from the old series while Cable's book is more a throwback to the original X-Force mixed with some newer characters. Perhaps it was the big expectations I had for the book but I found those first six issues quite lacking. All the ingredients for a good story were there with Fantomex (now split into three people, Fantomex, Weapon XII, and the female Cluster), Storm, Psylocke AKA Becky, and even the oft-hilarious Puck of Alpha Flight fame. Everything was just messy though. You had Bishop coming back from the future, an evil force causing trouble, that multi-armed lady from the Mojoverse who always is up to no good, and there was just too darn much going on. Then suddenly the seventh issue came out. 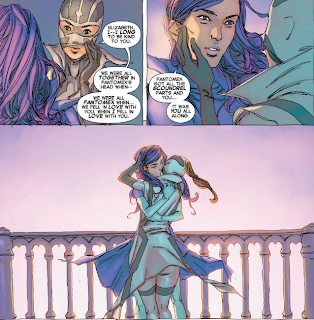 Issue seven and eight of Uncanny X-Force are focused solely on the complex relationship between Becky and three aspects of the original Fantomex. There are jumps in time between the present and past, with the past involving a summer she spent with Fantomex (the one of the three who kept the original name and has the thief aspects) and Cluster (a female version of Fantomex that has the more personable aspects). The present is about Becky and Cluster teaming up to try and rescue Fantomex from the clutches of Weapon XII but with the complication of how because the original Fantomex loved Becky, all of the three new ones do, even the "evil" one. The interesting aspects of all this is how in the seventh issue Becky realizes she loves both the new Fantomex and Cluster as they are all parts of the original Fantomex she loved. This is one of those rare times a comic has seriously explored polyamorous relationships and the fact that Cluster and Becky are women isn't treated as any sort of, "Look, two females in love, how shocking!" plot aspect but just casually introduced as, "Yeah, Becky is basically bisexual, who cares?" The complexity isn't in how Becky is interested in both a man and woman, but how she is involved with a man and a woman at the same time. Plus, the fact that the man and woman are essentially clones of the man she originally loved makes things even more complicated and soap-opera-esque, but in a good way. The way Sam Humphries is introducing all these interesting concepts of sexual fluidity and polyamorous relationships into a super-hero comic is wonderful and a series that once was overly confusing with a bunch of plot points now is focusing in on the relationship between four people and how it impacts their lives, along with lots of awesome fighting scenes. I was surprised to find I enjoyed the seventh issue of "Uncanny X-Force" as much as I did and that the eighth issue continued the trend was even more of a treat. The way this comic has improved makes me also reflective of the sadness at how another series that showed promise has become pretty subpar. The Decline of Fun in "Defenders"
Cullen Bunn is a friend of the blog (I've interviewed him) so I take no pleasure in speaking ill of his writing. 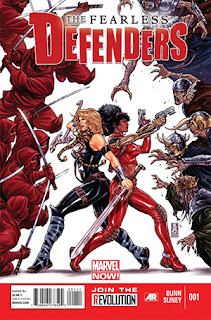 The thing is, when I started this website my goal was to speak the truth about my opinions no matter what, so it is with sadness I report that while "Fearless Defenders" started out as a pretty good read, as of the sixth issue I'm thinking I am done with the series. Between the villain who always has her plans go wrong while insisting it is all part of her master scheme, to how we had one of those, "Everything you know about this character is a lie," moments with Valkyrie, I've found "Defenders" to be slowly devolving into a dull slog. It also didn't help that most of the main characters were coming off as less-interesting versions of themselves...except for one new character I really liked. Her death basically happened to stop Valykire from rampaging around, but considering how fast she was introduced and killed off this comes off as the fridging of a character. We have "Uncanny X-Force" introducing all kinds of interesting ideas to its series with Becky's bisexuality and her polyamorous relationship with Cluster and Fantomex, as opposed to how "Fearless Defenders" introduces a bit of diversity in Ms. Riggs and kills her off less than a year after the character comes into existence. Basically, with Riggs killed I've lost the last reason I was still reading "Defenders". Both "Uncanny X-Force" and "Fearless Defenders" have been telling stories that involve a diversity of sexuality, and both have changed in overall story-quality too (for better and worse). Both introduced sexual diversity in a natural way, but then "Defenders" suddenly killed their diversity off while the other series is only getting more and more interesting. Plus, it doesn't help that the diversity introduced in the form of Riggs to "Defenders" was the only aspect of the comic I was still enjoying. Clearly, I'm going to continue picking up "Uncanny X-Force" and I eagerly look forward to reading more of it. Meanwhile, next time I go to the comic shop I think I may skim through the seventh issue of "Fearless Defenders" but unless something within its pages especially jumps out at me, the odds are very good it won't be taken home. Uncanny X-Force #7 and #8: 4 out of 5 stars. Fearless Defenders #6: 1.5 out of 5 stars. Probably the most shocking thing about Uncanny X-Force is that Marvel hasn't run stories about how "diverse" they are in USA Today. It's refreshing to know that mainstream superhero comics are capable of exploring sexuality in a mature way, and without the smugness that came with the wedding of Northstar, for example. Thanks for the recommendation; I will definitely be investigating that series further. 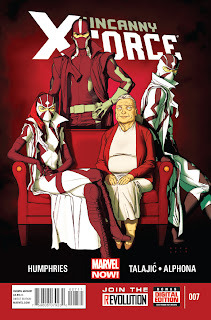 It is interesting Marvel is not drawing much attention to "Uncanny X-Force" and all that is happening within it. When you investigate the series further as you say you intend to make sure you keep in mind that those first six issues are pretty rough, so here's hoping things stay solid after this story-arc and don't go back to being a confusing muddle.